Featuring the Pierce Arrow quartet and 2017 Comedian of the Year James Sibley, comes the brand new production Decades. 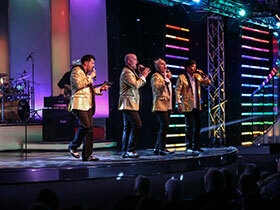 Take a one-of-a-kind musical and comedy journey through the 50's,60's,70's,and 80's with one of the biggest Branson shows. Comedic visits by Elvis, James Brown, and Ozzy Osbourne are just a taste of what’s to come from Branson's funniest comedian and 2017 Comedian of the Year. Decades is nothing but fun from start to finish. It’s a must-see Branson show!